Easter school holidays are almost upon us and Kawana Indoor Sports have a diversity of indoor holiday sporting activities for children aged between five and fourteen years of age. With the heat of summer that we've been experiencing and prices cheaper than vacation care, an energetic day or two (discounts for multiple days booked) with plenty of fun indoor activities, sounds like a win-win to me. 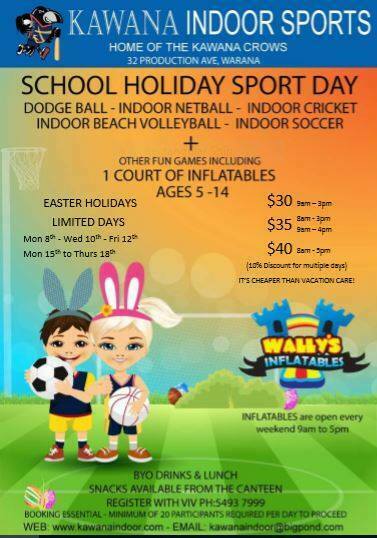 Wally's Inflatables, one of the Sunshine Coast's best indoor play and kids birthday party centres, is located at the same address as Kawana Indoor Sports and are open every weekend between 9.00am and 5.00pm. Bookings are essential with a minimum of twenty participants required per day for the activities to proceed. Please bring your own drinks and lunch, though snacks will be available, for purchase, at the Canteen. Please call Viv to register on (07) 5493-7999. With so much fun and excitement to keep the children busy in the upcoming Easter school holidays and activities cheaper than vacation care, Kawana Indoor Sports sounds like the 'go to' indoor location to keep the young ones active, healthy and entertained! A fabulous place to meet new people and make new friends too.